20% more Gold for all purchases! For many of you it's the season to celebrate the holidays with your loved ones, to give and receive gifts, and to enjoy your spare time. We'd like to celebrate with you by offering you 20% more Gold for every Gold purchase*! Enjoy this with us from Friday, December 25th noon CET (GMT+1) until Wednesday, December 30th noon CET (GMT+1). Once again, we’d like to say that you all make up a unique and wonderful community! We hope you have a great time! *A bonus will not be redeemed for purchases by SMS or pay-by-call. For bank transfers the date/time of the order is decisive for the Gold bonus and not the date/time the money is received. The banner image indicates whether the promotion is active. 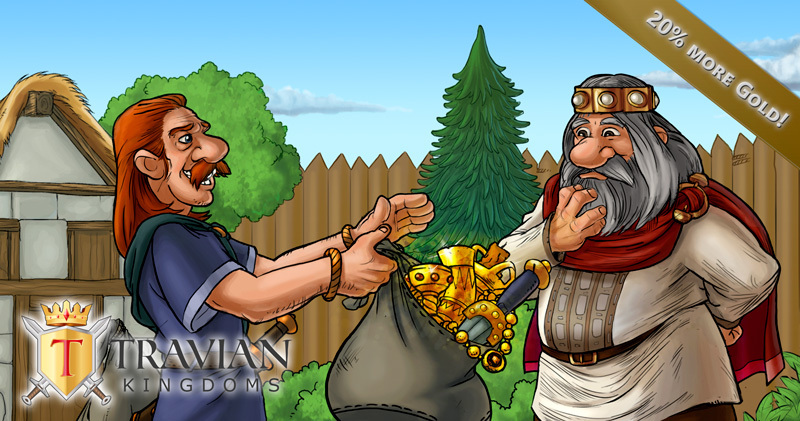 This offer is only valid for purchases within the browser version of Travian: Kingdoms.